Paddle one of our packaged trips along the Potomac. The "Ghost Fleet of Mallows Bay" is home to the largest number of visible historic shipwrecks in the Western Hemisphere, and offers a truly unique paddling experience. Paddling along the shoreline near Westmoreland State Park offers stunning views of sandstone cliffs rising one hundred to one hundred and fifty feet above the Potomac River, quiet waters, and beaches strewn with shark teeth, shells, and other fossils. Mattawoman Creek is a tidal-freshwater estuary representing approximately what the ideal conditions of a restored Chesapeake Bay would look like. The variety of local species make the creek a pleasant place to visit. A paddle on the Occoquan River, departing from the Occoquan Regional Park, offers a serene trip and scenic views of the historic town of Occoquan. Crow’s Nest is one of the few remaining undisturbed natural areas in the Mid-Atlantic, and the successful conservation of this 4000-acre peninsula was finally achieved in 2008. The name of this park means "Lee's Woodland," and got its name after Confederate general Robert E. Lee placed artillery positions in the area in 1861. It's a good place to paddle, as well as a place of historical significance. McIntosh run is a quick escape into nature and solitude. The creek is narrow in parts and tree covered, making for a peaceful paddle. The George Washington Birthplace National Monument is the birthplace of several notable American political figures, including three presidents, and today can boast of beautiful bucolic scenery accessible to most kayakers. Pastoral, undeveloped, and surrounded on 3 sides by water, you’ll feel as if you’ve stepped onto the set of The New World or stepped back in time 300 years when you arrive on the peninsula of Newtowne Neck State Park. 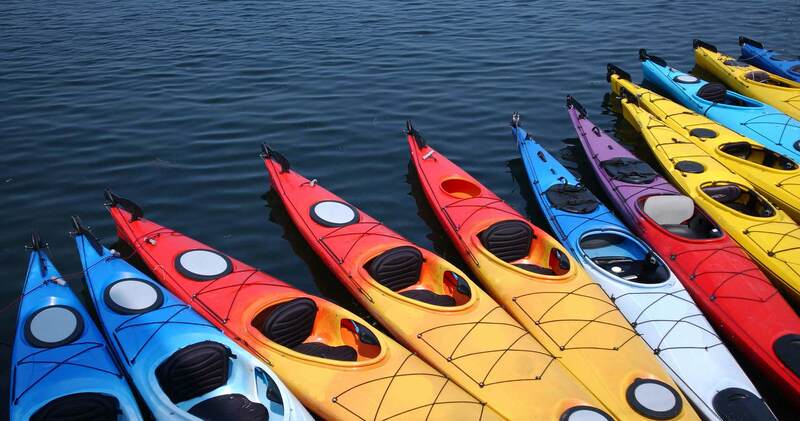 National Harbor gives families and beginning paddlers the opportunity to get out on the water while also enjoying a full suite of shops, restaurants, and entertainment right on the shore. A paddle out of Fort Washington Marina offers an entry into the Potomac with views of the historic Fort, as well as access to Piscataway creek for an off-the-river excursion. A paddle downriver out of Fletcher's Cove offers natural views of the Potomac River, with the C&O Canal National Park on the left shoreline and the George Washington Memorial Parkway on the right shoreline. The Georgetown Waterfront is a popular site for beginner paddlers in D.C., offering scenic views of the Watergate Hotel, the Kennedy Center, and Theodore Roosevelt Island. The Key Bridge Boathouse, formerly called Jack's Boathouse, is an iconic paddle craft rental located on Washington, D.C. waterfront. Paddle upriver for natural scenery or downriver for the city scape of Arlington and skyline of Washington, D.C.
Belle Haven Marina’s kayak launch is perfectly located on the protected side of the point for easy access to paddle Dyke Marsh, one of the few remaining freshwater tidal wetlands on the Potomac. Though Riverbend Park is the head of the Potomac Gorge, you don’t have to be a whitewater daredevil to get out on the river here. Trip ideas, how-to's, trip reports and more from the Potomac. Interested in other ways to have fun in the Chesapeake region? Visit Find Your Chesapeake! Browse through the events below to find a fun paddling event to attend.